With the biggest cricketing event, the ICC World Cup 2019 around the corner, India, just like any other team, are looking to zero down on their 15 member squad. Through consistent experimentation over the past few years, the team management has successfully developed a pool of talented players primarily for this very marquee event at the home of cricket, England, this summer. 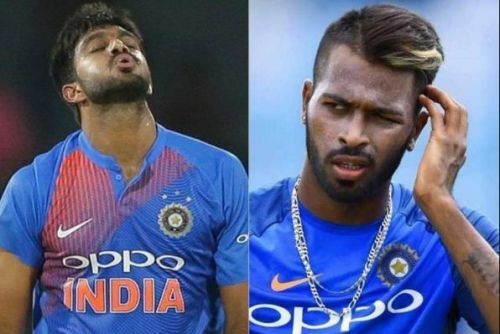 And just when, the Men in Blue appeared well-settled and perfectly balanced, especially with the blissful discovery of fast bowling all-rounder Hardik Pandya, they were jolted by his unexpected injury during the Asia Cup 2018. Ravindra Jadeja was the beneficiary then. A few months later, once again, the much-desired all-rounder was again out of the team, this time not for an injury but for his controversial remarks on national television. Like in the previous occasion, it gave an opportunity to another all-rounder, Vijay Shankar. And the Tamil Nadu player made the most out of the opportunity during India’s tour of Australia and New Zealand. In fact, his series of impressive performances have given the Indian selectors a pleasant headache of the ‘problem of plenty’ just ahead of the mega event. With Hardik fit again, the team management named both the exciting all-rounders for India’s last international cricketing assignment, a home series against Australia. However, just before the series started, Hardik has ruled out again due to back stiffness, and yet again, the opportunity went straight to Vijay. The 28-year-old player has grasped the opportunity with both hands and has performed exceptionally well so far in the series. Considering the fact that only 15 players can board the flight to England, it is worth looking as to who would be the best choice between the two all-rounders for the ICC World Cup 2019.